This new product was provided by the vendor for test and evaluation. Well, this is one of those cases where the actual article has greatly surpassed my expectations. We started buying fibreglass decorative pots some years ago, tired of the terracotta ones cracking or breaking under the strain. Structurally, these new plastics are a vast improvement but there are great divergences in the aesthetic look of them. I have seen imitation stone that is rather ugly, so I opened the box with great interest and could not have been happier with what came out. 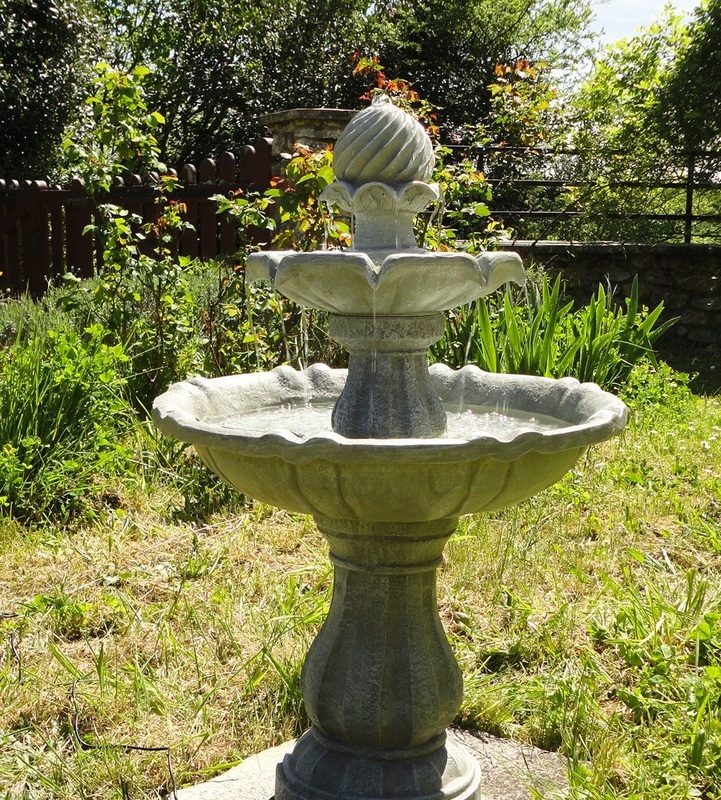 This classic sculpted fountain would look perfectly at home on an Italian terrace or in a Spanish courtyard. It is absolutely beautiful and, once assembled, topped with water and connected to the solar panel, I was absolutely delighted by the full effect. Assembly was simple enough but the instructions could be better. They show in great detail the initial three steps (which most people would easily accomplish with no guidance at all), but fail to address the way to connect the pump and solar panel. I finally did the only possible thing, but in fear of making a mistake and ruining the working guts (the pump assembly). My video shows the crucial steps to save you similar anxious moments, should you decide to buy this delightful little fountain. Apart from the huge visual appeal, the fact that the pump is powered by a solar panel was the main attraction for us. The panel is quite large and arrived already pretty much charged (green light showing) so we were able to see the water in movement immediately. It must be fairly efficient because the pump continued to work for 6-7 hours a day during a very cloudy week we had recently. The assembled fountain is fairly light (about 11 kg) and can be moved easily (before adding water!). Despite its lightness, it sits securely on a flat surface and looks quite solid. You can place it just about anywhere, in a sunny location, of course, but even indoors if you can locate the solar captor appropriately. The cable connecting the tiny pump to the solar panel is 5 m long, which gives plenty of options for placement in full sun. On a terrace, one can run the cable on a wall and mount the solar panel above ground. Just remember that the On/Off switch is behind the panel, so it should be easily accessible. In place, it looks authentic, ornate but not gaudy and the size is ideal for a moderately small space. The effect is so pretty and the water tinkling noise so charming that I took a short video to give you an idea. The best fountain of this type I have seen so far. Absolutely charming! P.S. We are not the only ones to find the fountain attractive. 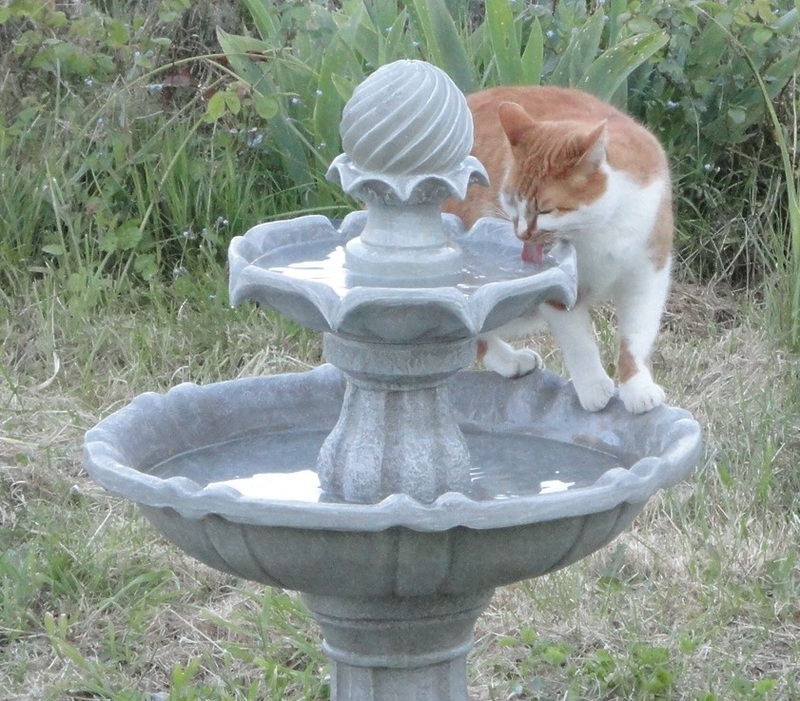 Our ginger thug has started to drink out of it every evening, as soon as it's turned off.